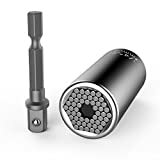 Are you tired of digging through dozens of tools and all sorts of other clutter in your basement or garage just to find the screwdriver you need? Or perhaps lots of your tools are old and you’ve been meaning to upgrade but you don’t want to cough up the cash. Don’t worry, we’ve got you covered. First, get yourself a Kusonkey Universal Socket. It’s $10 on Amazon and it replaces your entire socket set, from 7mm all the way up to 9mm. 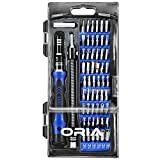 Next up, pick up the ORIA 56-in-1 Screwdriver Set that replaces every screwdriver you can imagine with a single kit. It also replaces screwdrivers you can’t even imagine since it comes with a flexible shaft to reach screws you’d never get to without it.